Nook GlowLight Plus is a 2015 e-reader from Barnes & Noble, selling at $129.99. The 2015 Kindle Paperwhite by Amazon is selling at $119.99. Both ereaders are excellent and are in the same price range, but there can be only one winner. Let’s compare the two devices side by side and find out which one is the best. Nook GlowLight Plus features a 300 dpi E Ink display with enhanced contrast – on par with the Amazon Kindle Paperwhite’s screen. The Nook GlowLight Plus is 6.4 in x 4.7 in x 0.34 in and weighs 6.9 ounces. It is lighter than Paperwhite by 10 g and slightly smaller. It runs Android 4.4 on a 1GHz CPU with 512MB RAM, 4 GB built-in memory and WiFi – very similar specs to the KPW, except the type of operating system. The 6″ screen has a resolution of 1448 x 1072 (virtually the same as the competitor) with frontlight and touchscreen. Nook GlowLight Plus has 4 GB of memory, just like the competitor – you can load thousands of books on it. All books purchased from Barnes & Noble are stored in the Nook Cloud for free. The design allows this Nook to withstand water and dust, so you can read in the tub, at the beach or at the pool without any worry. The Nook GlowLight Plus can be submerged underwater – for up to 30 minutes at a depth of 1 meter. Kindle Paperwhite is not waterproof. When comparing the price of the Nook GlowLight Plus vs Kindle Paperwhite, you will see that the Nook is $10 more expensive than Paperwhite, but there are no ads on it. Just like the Kindle Paperwhite, the only physical button on this device is the on/off button – the Nook logo. Just like the KPW, it is capacitive touchscreen operated, with an anti-glare, scratch resistant display and GlowLight technology for various light settings including in the dark. The Nook Glowlight Plus’s light has more of a blueish tint to it, which makes the background appear whiter. You can read on the Nook Glowlight Plus for weeks on a single charge. The body offers a premium feel and durability. The back is made of aluminum, not plastic. With a gold colored rear and a subtle cream-colored front bezel, the Glowlight Plus doesn’t look like your average ereader. The GlowLight Plus works with a Nook Reading app — available for iPad, iPhone and Android — that lets you begin a book on your e-reader and continue on your phone or tablet. The GlowLight Plus is capable of reading Epub and PDF files, but not Mobi or AZW files (Amazon’s format). The Plus does not work with Adobe DE, thus no support for library ebooks or books bought elsewhere. Book shopping by default is at the Barnes & Noble website. 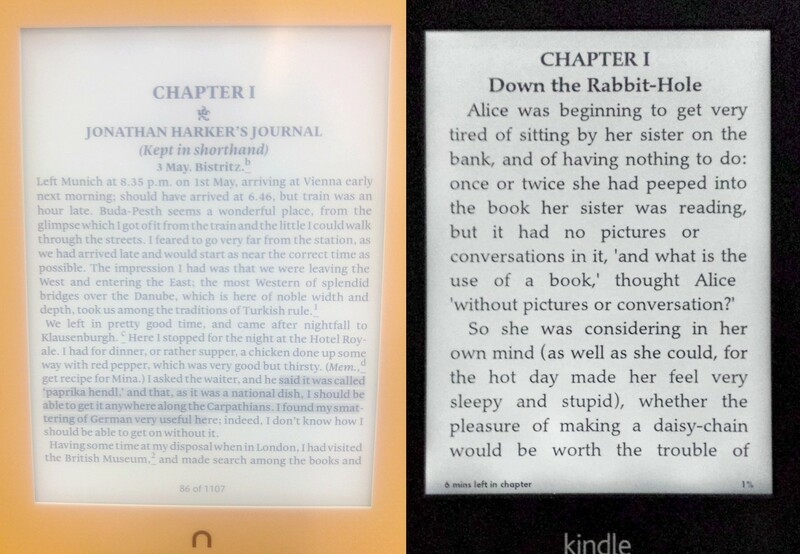 Just like the Nook, the Kindle Paperwhite features a 300 dpi E Ink display with great contrast. The device measures 6.7 in x 4.6 in x 0.36 in, and the Wi-Fi version weighs 7.2 ounces – it is very slightly larger and 10g heavier. The Kindle Paperwhite runs on a Linux-based operating system, has a 1GHz processor, 4GB of built-in memory, up to 512MB of RAM, 4 GB built-in memory and WiFi. The 6″ screen has a resolution of 1440 x 1080 px. Books purchased from Amazon are stored in Amazon Cloud. Send to Kindle apps and custom Kindle email address makes emailing ebooks and documents to the Kindle Paperwhite easy. Standard Paperwhite cost $10 less, but it comes with special offers, sponsored screen savers and ads for Kindle books that show up on your device. Like Barnes & Noble, Amazon has moved to a more responsive capacitive touchscreen in the Kindle Paperwhite. Comparing the Kindle Paperwhite vs Nook GlowLight Plus in bright light, the Paperwhite has a lighter background, while the Plus’s is darker gray. The Paperwhite promises a glare-free screen and a built-in light that adjusts to your environment, just like the Nook. Just like the Plus, the Paperwhite has no physical buttons on the device beyond an on/off button. You can read for weeks on a single charge. The Kindle has a black shell intended to emphasize the white on the E-ink screen. The typography is on par with the Plus. The KPW cannot read Epub without conversion, but supports Mobi or AZW files (Amazon’s proprietary format). The Kindle Paperwhite is a little more responsive and snappy than the GlowLight Plus. Amazon offers a selection of more than a million titles priced at $2.99 or less and more than 2 million titles priced at $9.99 or less. The Paperwhite and the GlowLight Plus are both thin touch-screen devices with very similar specs. They are almost even when it comes to price, display, weight and battery life. Which one is the best? The Amazon Kindle Paperwhite remains the top-choice e-reader for most people, as it offers the best blend of price, performance, and book offerings. However, the Nook Glowlight Plus is the most stylish and the most affordable water-resistant ereader there is. As always, the choice is to the buyer. Nice review. Good points on both, but for me i’ll take the reliable e-reader and not pick the one with the looks!